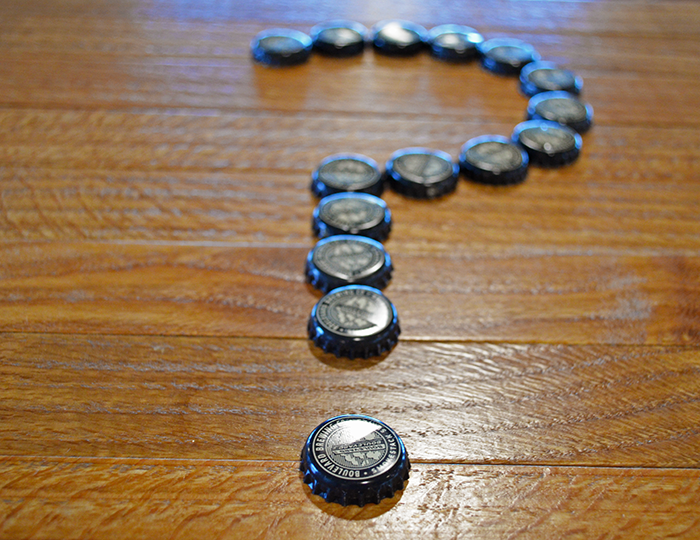 Each Wednesday, submit your burning Boulevard beer questions on Twitter, tagging @Boulevard_Beer and #WWKW. I'll sift through the questions and select my favorites to answer in a blog post that will be shared here each Thursday. Everything is fair game! Go! Yes. Rye on Rye on Rye is a Smokestack Series Limited Release beer while Rye on Rye on Rye on Rye was a Brewhouse One Series beer. Being excessive is fun. We release City Market Cider in the fall because that's when the apples are harvested. Brewing City Market year-round would require either a super expensive storage facility where we could hold apples year-round or a switch to using concentrated juice and at this time, we aren't interested in pursuing either option. We've done tests with fermenting concentrated apple juice and it just wasn't as tasty as waiting until the good people at Sibley Orchards & Cider Mill were ready to press juice. YES! We recently announced that New Mexico will be the 41st state to see Boulevard beers. For details, head to our official press release announcing the expansion. When we start working on a new beer, our brewers and lab folks meet to discuss what they'd like to accomplish with the beer. With those goals in mind, Brewmaster Steven Pauwels or a member of our brewing team writes a recipe that becomes the first test batch. Given the extensive knowledge our team has regarding the raw materials, processes and equipment we use, our test batches usually come out pretty close to what we thought they'd be, but that's only half of the equation. While we might (internally) feel good about the beer, we also need to make sure it's something that our fans will enjoy so the Beer Hall becomes very important at this step in the process. We create profiles for each test beer on Untappd.com and our Beer Hall staff is trained to ask our guests questions to get their thoughts on new/test beers. We pull together all the information from those points of feedback to help us make adjustments for each following test batch. Most of the time, the alterations are fairly subtle, but there are instances where we make major adjustments batch to batch depending on internal and external feedback. As a company, roughly 65% of our business happens in off-premise retail locations (liquor stores, grocery stores, gas stations, etc.) while 35% happens in on-premise accounts. Yeah, it definitely matters as that breakdown informs us where our sales reps should be focusing their time and energy. Dude, trust me, I'm bummed to see it go as well, but I have to say (obvious bias aside) that I'm absolutely loving Tart Apple Radler. The challenge of introducing a new beer, especially one that's more specialized/niche like a radler, is that something has to go to make room for it. In this case, we didn't necessarily stop loving Cranberry Orange Radler in the same way that you haven't stopped loving us, but we saw an opportunity to try something new with our radler series. If you dig blood orange character in beers, you should stop by the Beer Hall soon as we have TEST - Blood Orange Berliner Weisse on tap and available in crowlers at our small bar.